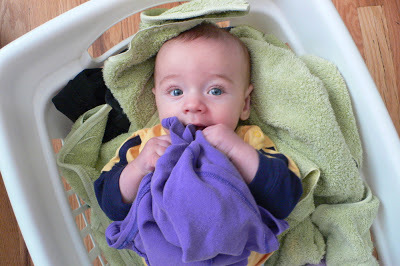 My very first laundry buddy. He’s almost 8 now. Whenever this happens, I find myself scrambling for some sort of neat checklist to deliver so that I can get an A+ in motherhood. Not only that, but often during my run-of-the-mill motherhood day, I mentally create said lists so that if asked, I can prove to anyone, anytime that I am, indeed, useful and productive during the day. At the same time I have often wondered: Can’t you see it when you walk in my door? Can’t you look around and see the evidence of “what I have been doing all day”? This morning it hit me. More often than not, there is no evidence. You cannot walk into our homes and see it, touch it, or smell it. Great motherhood happens all around us. But it is often invisible to outsiders. You might see a bare kitchen table. But that doesn’t mean it has been that way all day. Meals, snacks, crafts, homework, splashes, and scribbles have covered that table today. And ten minutes ago, I was on my hands and knees sweeping up the last crumb. You might not hear a vacuum running or see the tell-tale lines on the carpet. But that’s because so many feet have scampered across the floor since I cleaned this morning. You might see a sink full of dishes. But that’s because in the middle of my washing I felt a little tap on my backside and turned around to see a blinking blondie with outstretched arms and a book in his hand. You might smell clothes in the hamper. But it was empty this afternoon. Just as I finished the laundry and was replacing the empty basket, someone scored a three-pointer over my head with a pair of stinky socks. You might see a sparse pantry. But I didn’t forget it was grocery day. I spent an extra hour talking with one of the kids about a bully at school and I’m leaving the shopping until tomorrow. To shop or not to shop? That is the question. 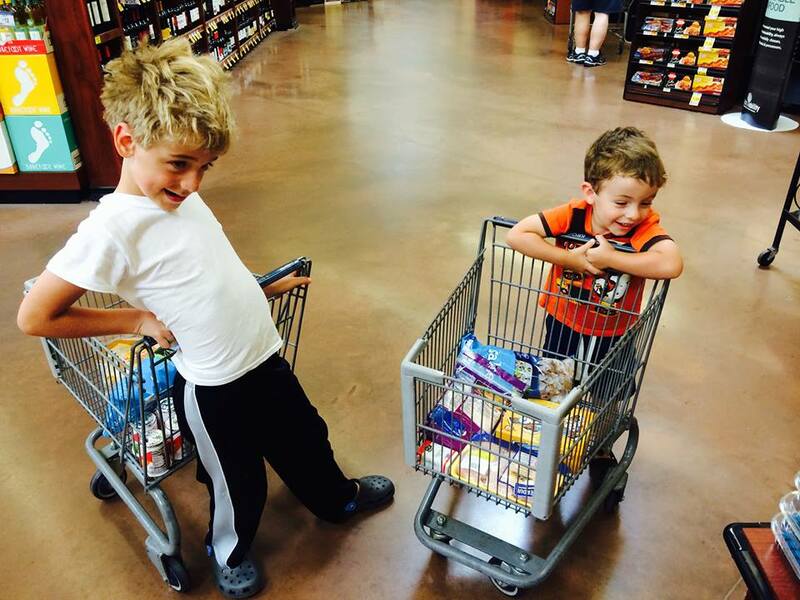 And then if you shop … do you shop fast or fun? You might hear the crunch of un-raked leaves as you walk through our messy yard. But that’s because I stopped raking to tackle the bambinos and shower them with kisses. You might see me sitting at the computer. But I haven’t been sitting here all day. In fact, this is the first time I’ve sat down today. I, for one, am very blessed to have a hubby who helps with all the household responsibilities. We are a good team. But it wasn’t always that way. I have done the single mom thing. And I know it’s not easy doing everything alone. And just to be clear, I am NOT, by any means, saying that our worth as mothers is limited to our domestic abilities. After all, I am a working mom, too. And next time someone asks you: “What do you do all day?” Just smile. You don’t have to prove anything to anybody. Because if you are a mama, you know. And so do your kids. And that’s what counts. Our little helper. 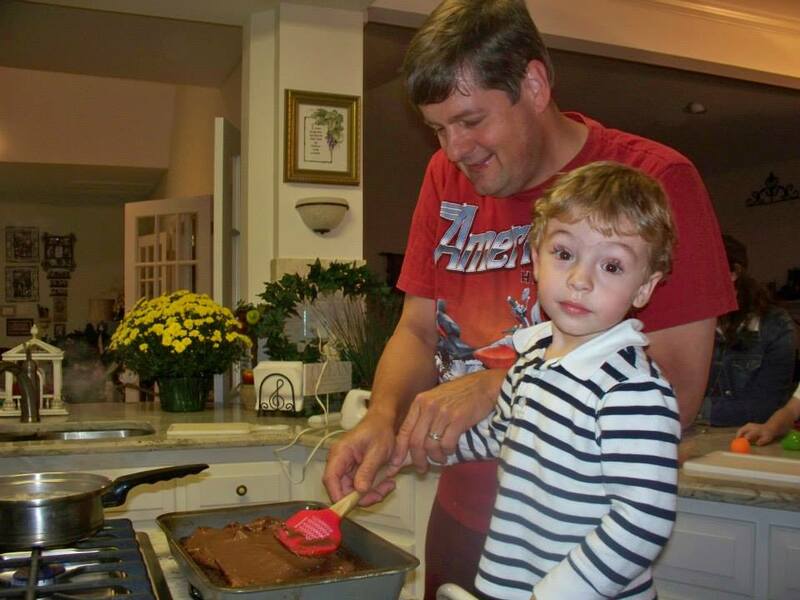 Man, does he LOVE the kitchen–just like Poppa (my dad)! Hey, Daddy-o, is is just me, or do things take a little longer with meal-prep these days?